Breadfruit is a tropical fruit, belonging to the Moraceae family. It is related to other exotic fruits like breadnut, jackfruit, figs and mulberries. Breadfruit is a staple food in many tropical regions. The fruit can be roasted, baked, fried and even boiled before consumption. The flesh of the breadfruit has a nice fragrance and a sweet taste. Breadfruit is an excellent source of potassium. This heart-friendly nutrient reduces blood pressure in the body and regulates the heart rate by minimizing the effects of sodium. It conducts electrical charges that drive muscular contraction in the skeletal system including the heart. Dietary fiber helps reduce cholesterol by preventing its absorption in the gut. It lowers bad cholesterol (LDL), while elevating good cholesterol (HDL) in the body. It decreases the triglyceride levels, which is one of the main causes of heart attacks. Breadfruit contains good amounts of antioxidants, which help the body to develop resistance against infectious agents. It also scavenges harmful free radicals from the body that lead to aging and other age-related diseases. One cup of breadfruit provides 60 grams of carbohydrates, the primary source of energy in the body. It is very beneficial for athletes and gym goers. Fiber in breadfruit inhibits the absorption of glucose from the food we eat, thus controlling diabetes. It contains compounds, which are needed by the pancreas for producing insulin in the body. Fiber in breadfruit flushes out the toxins from the intestine, aiding in proper functioning of the bowel and intestines. It prevents digestion-related diseases like heartburn, acidity, ulcer and gastritis, eliminating toxic compounds from the gut. Breadfruit protects the colon’s mucous membrane by warding off cancer-causing chemicals from the colon. Breadfruit contains relatively high amounts of omega 3 and omega 6 fatty acids, which are vital for the proper development of the mind and body. Eating toasted breadfruit flower can help relieve toothache. Applying crushed breadfruit leaves on the tongue can also cure thrush. Fresh breadfruit extracts may help to reduce unwanted inflammation. It inhibits the activity of pro-inflammatory enzymes and prevents the overproduction of nitric oxides, thus preventing excessive inflammation. Drinking breadfruit juice helps to even out the skin tone and firm the skin by rejuvenating its appearance. The high amount of Vitamin C in breadfruit helps in the production of collagen, a protein which provides elasticity to the skin. The antioxidants in breadfruit provide an effective shield against sun rays and sun damage. It also encourages the growth of new cells to make the damaged skin appear smooth and young. Ashes of the breadfruit leaves are useful for curing skin infections. The latex of the breadfruit tree is applied on skin surfaces affected by skin diseases like eczema, psoriasis and inflammation. Breadfruit contains several hair-friendly nutrients, which are required for maintaining the health of the hair. Vitamin C in breadfruit facilitates the absorption of minerals and provides nourishment to the hair. Breadfruit is a good source of omega 3 and omega 6 fatty acids, which naturally condition the hair, reducing hair breakage. 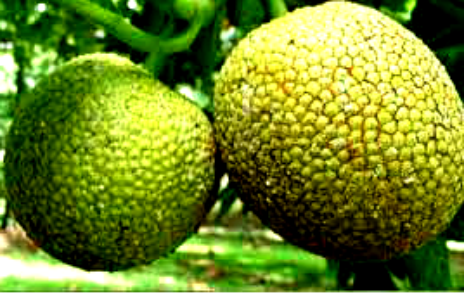 The fatty acids present in breadfruit regulate the sebum production in the scalp, reducing dandruff and itchiness. It also inhibits scalp inflammation and cell death, preventing hair loss. The moderate amounts of iron in breadfruit improve blood circulation in the scalp, stimulating the hair follicles to promote hair growth. Breadfruit contains moderate levels of essential vitamins and minerals. It is rich in riboflavin, iron, niacin, thiamin, iron and phosphorus. It contains minerals like potassium, copper, iron, magnesium, calcium, zinc, manganese, selenium and phosphorus. It also contains adequate levels of protein. 100 grams provide 7.4 grams, approximately 23% of the recommended amount. It is low in saturated fats, cholesterol and sodium. Like other tropical fruits, breadfruit also contains high amounts of calories. 100 grams of breadfruit provides 102 calories. It contains small amounts of flavonoids and antioxidants in the form of xanthin and leutin. Breadfruit contains high amounts of Vitamin C. 1 medium breadfruit provides 29 mg of vitamin, amounting to 48% of the recommended daily allowance.